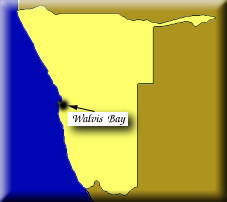 The port of Walvis Bay was declared to be British territory in 1878 and annexed to the Cape Colony in 1884 when the Germans began to set up a colony in the surrounding area. The German colony was captured in 1915 and became a South African mandate in 1919. It attained independence as Namibia in 1990.